If you are like me, you probably had a slingshot as a kid, and once you were old enough to shoot firearms you probably didn’t put much more thought into your slingshot anymore. Whenever you think of a slingshot, you will automatically think of a toy that some young punk used to use in the 1950s to terrorize small children and animals. Before they became a toy, they were actually a serious weapon to be used to hunt, fight off other tribes, and even used as self-defense weapons that will never run out of ammo. The more modern survival and hunting slingshots can withstand the elements and really keep you alive with nothing but a pocket of rocks. Not to mention that are now made with military grade materials. As a teen, I worked construction in a high end remote mountain subdivision that didn’t allow firearm shooting. The place was loaded with squirrels and we would chase them around shooting rocks at them with our old wrist rockets. As a survivalist, I always try to keep my mind open to alternative equipment. If for some reason I can’t use my firearm, I can always take my survival bow for taking game, but what do I do if I want to conceal my weapon while I am carrying it? A discrete slingshot can fit the bill. 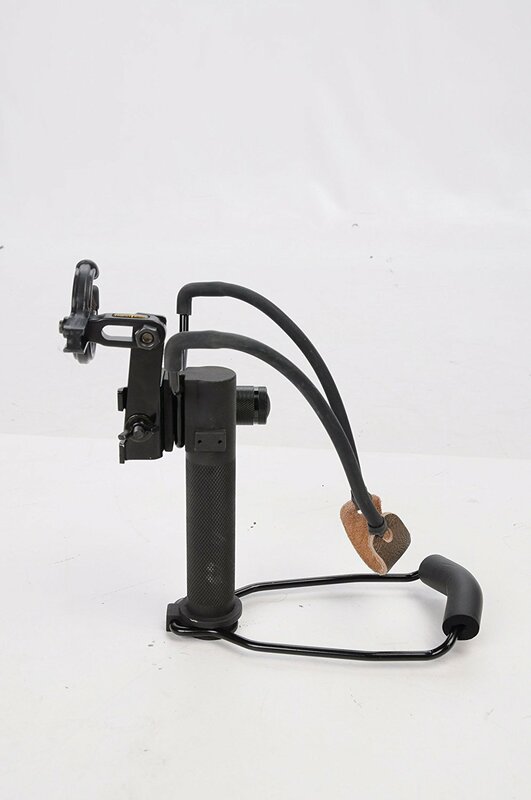 There are many types of hunting slingshots on the market, and once you get into the hobby there is a good chance you may start making your own and creating your own style of slingshot. Flat latex bands (check online for sources) lend themselves to making all sorts of slingshots. You have probably seen the classic wrist rocket consisting of a steel frame with an arm brace and surgical tubing for bands. These are very popular, relatively cheap, powerful, and accurate. This is where most of us start our slingshot experience. 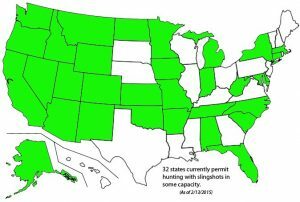 The biggest problem is that they are not legal everywhere. Some places like New York make it illegal to own slingshots with an arm brace. Be sure to check your local laws on ownership but also usage. If you are going to be slingshot hunting, most likely small game hunting such as bird hunting or maybe goose or waterfowl make sure you not only know your hunting regulations but also your hunting season and make sure you have the appropriate hunting license if you need one. Wildlife management on public land is really important so that future generations get to experience the thrill and in many cases, necessity of hunting. It is possible to use the bands and pouch without any kind of frame to hold them. You take the end of both bands and pinch them between your thumb and first finger, make a fist and draw right over your thumb. You must be careful with this as you tend to smack your thumbnail with your projectile if you hold your thumb too high. The most powerful hunting slingshots are called “Starship” slingshots. They have the fork forward of the handle allowing you to increase draw length thus stored energy in the bands. They sort of look like the starship Enterprise, hence the name. My early experiences chasing squirrels around the Rockies made me a little skeptical about how effective slingshots can really be for hunting. Backwoodsman Magazine over the years has run several articles featuring the slingshot, and how effective they are on small game. Reading these articles got me a little more interested in the idea, but what really turned me onto hunting slingshots was the advent of Youtube and being able to actually see people shooting different types of hunting slingshots. After watching a few videos of British slingshot (catapult) hunters making headshots on rabbits, you will be sold on the idea of adding a slingshot (or several) to your collection of supplies. Speaking of Youtube, be sure to check out The Slingshot Channel. Joerg Sprave will teach you everything you never needed to know about rubber powered weapons and how to make them. The big German with the jolly laugh can teach you how to weaponize everything, from your trash or a Frisbee to your beard (yes, your beard). He makes all sorts of slingshots (all legal) that range in size from a small, easily concealable model to one that will shoot bowling balls. A slingbow will shoot arrows, some of them strong enough to hunt big game in certain circumstances. A regular slingshot can be modified to shoot arrows as well that should be able to take most small game. As an adult shooting a slingshot, I have discovered why I had so much trouble squirrel hunting as a teen: I was using rocks I picked up to shoot at the squirrels. The problem is that rocks are not all the same size or weight, so there is a measurable difference in how each one shoots. While rocks will be okay for plinking and recreational shooting, serious practice and accuracy won’t be had with rocks. Modern shooters use marbles, steel ball bearings, lead shot, and the aforementioned arrows. Marbles are used for target practice and hunting light game. Steel ball bearings are used for hunting, and lead shot is used for heavier game and personal defense. I remember as a kid seeing a picture of a Green Beret using a slingshot. The IRA used slingshots to harass the British in Northern Ireland, and guerrilla forces the world over still use them. Joerg Sprave made one from stainless steel that is slightly taller than your hand, and has a pommel that will serve to put the hurt on anyone you hit with it, not to mention being capable of shooting lead balls through plywood. This is easily concealable and should be legal in most places (again, check your local laws). Like any prep, a slingshot will do you no good if you don’t become proficient with it. 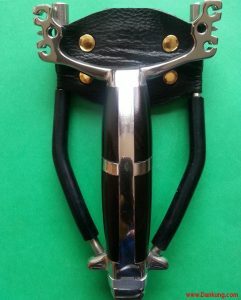 I have made sure everyone in my family has a slingshot in their BOB, but I have failed to make sure we all practice regularly (bad on me). If you think you can pick up a slingshot and, without practice, hit a rabbit at five yards, think again. On the other hand, with practice you can be hitting that same rabbit at 30 yards. I liken shooting a slingshot with shooting a bow on instinct. With practice it becomes second nature. A slingshot or even multiple slingshots are something I think every prepper should make the investment of time, money, and effort to learn about and become skilled with. They are something that flies under the radar for most people, so they will not be high on the list of banned items should things go south. A solid survival slingshot is pretty easy to make and even easier to buy. A strong branch and some pretty nice elastic will give you something about as good as you would get in a local store. The issue is that you will need to learn to tie tubes, attach pouches, set the tension and pick the right type of wood. That really requires a whole lot of time that you could spend building up a nice tan on the beach or working on getting in shape, so it is better just to purchase one that is already set up for you that way you are not forced to have to learn anything other than how to shoot it. Whenever you are ready to think about purchasing a survival slingshot, check out the ones that are listed below, as they are the best on the market right now. A big part that really makes this a really nice hunting slingshot is the tubing. 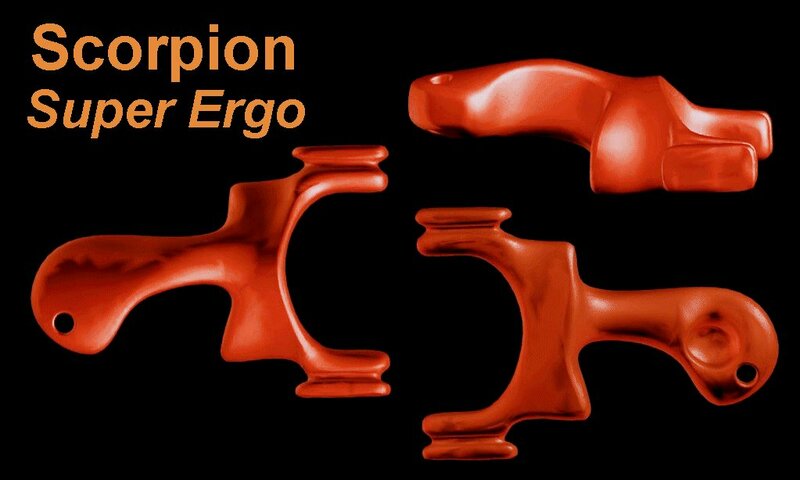 This model you will want to possibly upgrade the tubing that have a stronger pull weight and more elasticity. Right out the box is best for a child or a beginner. The wrist guard and arms are made from weather resistant aluminum that has a 4.5-inch gap within the fork. 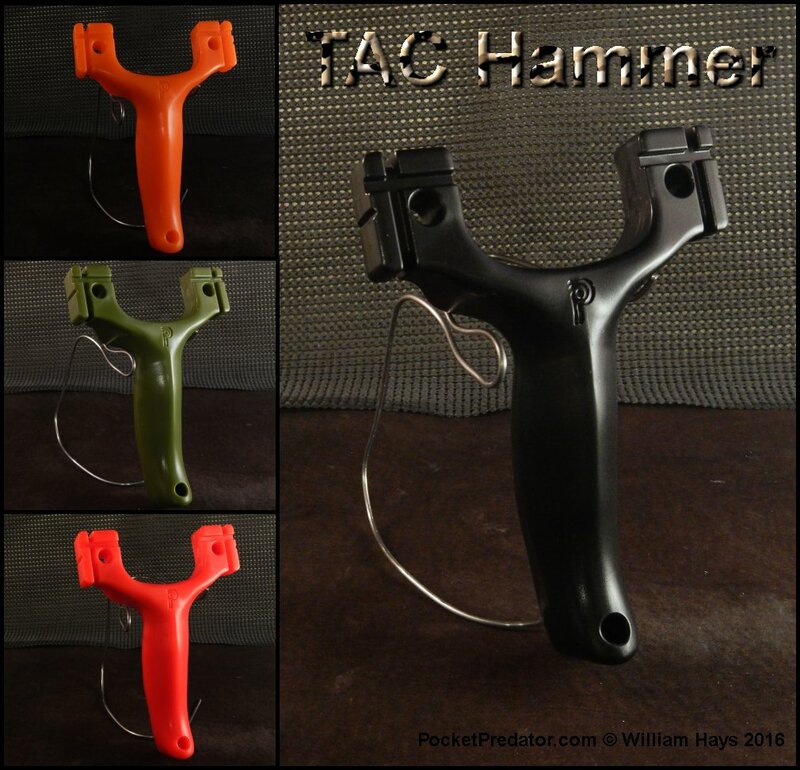 The rig is attached to a plastic handle that can handle half inch ammo easily. A bit more should have gone into the building of the handle which is a straight grip that does give you plenty of leverage, but isn’t really that comfortable. The wrist guard does fold up easily and will fit in your backpack, bug out bag, or footlocker. 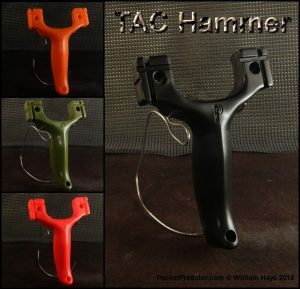 Heavy to constant use or for those using it to hunt will find that this model is too small for their needs, but for controlling pests, learning the basics of slingshots or just shooting targets, this is the best starting block. Just a few little upgrades can really make it the best one out there. Not to mention the price is really affordable. If you haven’t found a custom slingshot maker yet, and you don’t make them yourself, you should contact Pocket Predator to make a custom one for you. They make really amazing stuff to exact specifications that is made with side shooters in mind as well as being compact and small. 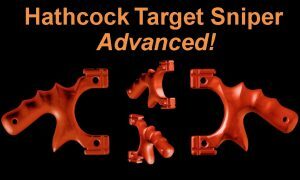 Before you drop a whole lot of money on a custom slingshot, check out pocket predator and side shooting style and grab the Hathcock Target Sniper. This is a slingshot that really keeps your wrist in a neutral position to really transfer pressure without having to bend your joints or even stress your fingers. The base is made from steel and is surrounded in a resin for a really strong feel that won’t dig into your skin. The end of the fork is universal so you can mount it with squares, tapered, flat bands, or tubes for either over the top shots or side action shots. It even has a decent price point as well. The simple yet straightforward design from Dankung is great in looks as well as function. It is made from aluminum and the pistol grip body is really comfortable in your hand. 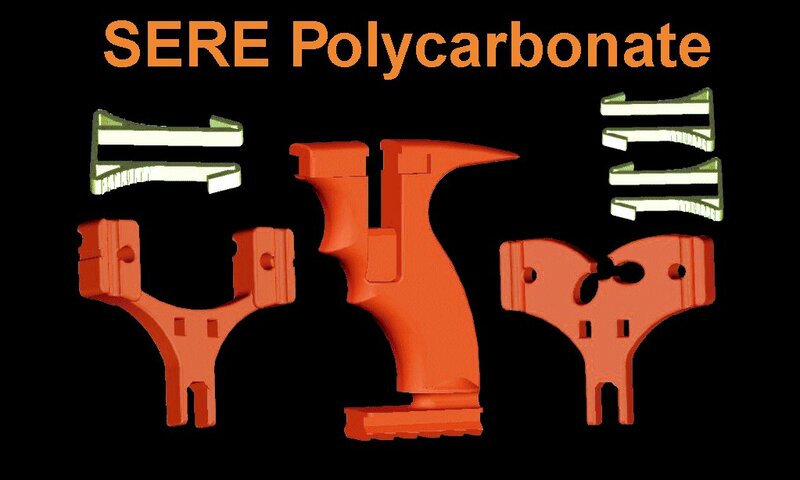 It has penetrating holes that you can attach things like survival knives or lanyards to. The forks rotate to make it easier for whatever grip you like best and how you plan to use it to attack. It is only about a half a pound, so it is really easy to carry around without it being super heavy. It has the Dankung quality stamp, that comes with a pretty steep price. The fame of this slingshot happens to be just how accurate it is. It gives you the ability to really pinpoint your target and you can easily put someone’s eye out from long distance. Each part is made through a computer machining process that only can be done through a computer. 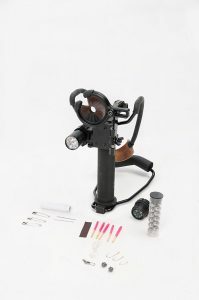 It is great for sport shooting or just shooting targets that you use in your back yard. 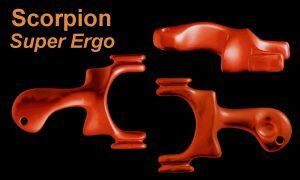 If you are looking for a high quality commercial grade type of slingshot, then you are going to love this one. It works for recon missions, hunting, target shooting and so much more that you could ever think of. It has a Quick Shot Whisker Biscuit in between the forks that works to guide arrows but can be put down when you are just using regular rock ammunition. It is made from aluminum as well as steel which can hold up to 25 pounds of pull, but can accommodate the heavier bands or tubes. 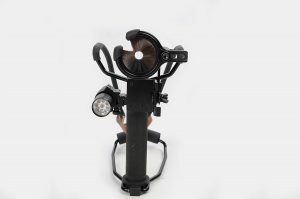 It also comes with a great LED flashlight while having a waterproof storage right in the handle. There is even a hole on the side for archery stabilizers and fishing reels. It isn’t best for killing anything bigger than a rabbit or a bird, but with all the goodies that come with it, it is screaming survival and it does have a hefty price, but you are getting what you are paying for. 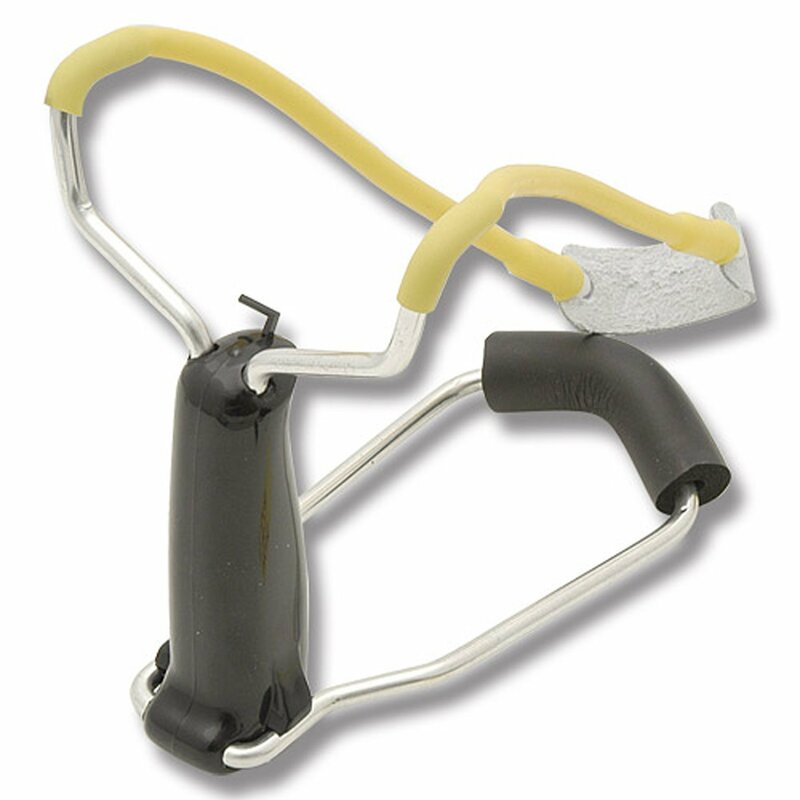 Overall, these are the best types of slingshots out there on the market right now. You certainly can’t go wrong with any of these. Starting with a beginner model all the way down to one that works for advanced shooters. In the end, it is all about what your needs are and what you are looking for that will determine just which slingshot is best for you.